New information in the form of a study report recently eleased by the Irish Department of the Environment on order of the Commissioner for Environmental Information shows that by the Government's own figures, a setback of at least 1209 metres from a 175m / 3.5MW wind turbine is required to underpin a 40dB absolute limit. This is a startling departure from the current regulations which require just 500m. That excellent web site Concerned About Wind Turbines – Donegal (CAWT) has put important and previously cunningly concealed information into the public domain by an AIE request to our old friends, the Department of Communications, Climate Action and Environment. Despite the Department playing hide-the-parcel, the Commissioner for Environmental Information( CEI) gave them a slap on the head and told them to reveal their dark secrets. The Commissioner made it clear that the information should have been made available to the public before any decision was made by the Department. The Commissioner also pointed out that this would enable the public to make submissions before any decisions were made. It is a very sorry state of affairs when a Commissioner has to tell the government how democracy works. Hang your head, Minister Naughten, and off to the Naughty Corner you go. The documents that the Department of Communications, Climate Action and Environment were trying to hide consist of a report on Wind Turbine Noise Modelling commissioned from the RPG Group by Sustainable Energy Authority of Ireland (on behalf of the Department) dated 11 May 2015 and a series of subsequent data analyses against varied criteria up to 13 July 2015. When one considers that this was supposed to be a “tame report” filed under ‘His Master’s Voice’, it actually makes for very interesting reading. The report shows that the current clearance distances being discussed by the Department are woefully inadequate given the typical wind turbine size in any future development. Current wind turbines are likely to have (at least) a power rating of 3.5MW and a tip height of 150 to 175m (up to 200m in low-wind areas). This is five (5) times larger than the 0.66MW wind turbines typically installed in 2006 when the current Guidelines were issued. Table 3.2 of the report shows that an estimated setback distance of 1209m (i.e. 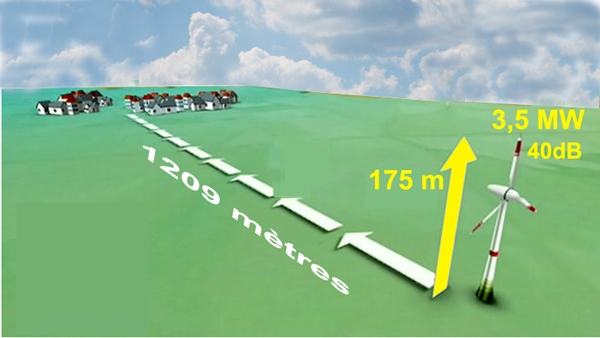 1.2 km) would be the absolute minimum distance necessary to meet the 40dB absolute noise limit proposed in the draft revision of the Wind Guidelines. Many argue that this 40dB limit is still not enough to ensure there is no distress caused to people in their homes, which means we should really be looking at 1.5 km; which is triple the current 500 metres! The AIE has completely exposed the severely flawed planning policies being pursued by the current Government, and confirms what we all knew already – the current Guidelines offer absolutely no protection to rural residents. The Government’s current action of sticking their heads in the sand whilst countless families are driven from their homes cannot be allowed to continue. As pointed out on numerous occasions in previous blogs (and in our arguments to the UN), Ireland does not have the legacy of planned rural settlements like our European cousins, where a consolidated settlement pattern has been implemented for decades, even centuries. Their farms are huge and farm labour lives in consolidated hamlets and villages. Irish farms have historically been small, and sons and daughters frequently build on parcels of land from the family farm, or farmers sell off plots to people who prefer to live in the quiet of the countryside. This means there are little farms and houses dotted haphazardly all over the place, and the spaces between people’s homes are not big enough to accommodate big industrial wind farms, particularly when they should be at least 1500 metres from the nearest house. “seeks to achieve a balance between the protection of residential amenity of neighbouring communities in the vicinity of wind energy developments, and facilitating the meeting of national renewable energy targets”. The reality is the opposite of this claim – as turbines get more powerful, so the harm that they cause to people will also increase. Ireland was never really big enough for wind farms in 2006, but now it is an impossible dream without hurting a lot of people. Planning is all about balancing competing interests. The key tool used for this is Zoning Policy, whereby any industrial machinery or plants are kept well away from residential areas by appropriate zoning. Industrial activities are directed to areas zoned for industrial use and homes are built in areas zoned for residential use. This is a sensible approach that has stood the test of time. It is also not rocket science, just common sense. However, when the issue of wind farms is put on the table, the rule book is thrown out of the window. How can this be lawful? It is illegal and unfair on so many levels. The Department received submissions from 7,497 individuals and organisations in response to the public consultation on the proposed draft revisions to the 2006 Wind Energy Development Guidelines in relation to noise, setbacks and shadow flicker. The Department’s web site currently states that following consideration of the submissions, the revisions to the Guidelines will be finalised and issued to planning authorities under Section 28 of the Planning and Development Act 2000 (as amended) during Quarter 3 2014. In other words, they are trying to tell us that the consultation is over. But how can there be a proper consultation without proper information? The AIE Commissioner is also clearly of the view that further consultation should be allowed, given the discovery of this information that has been hidden from us. We now know that for 18 months the Government has been hiding this information which clearly shows that the current setback of 500 metres is useless in protecting rural residents. Remembering that this is a “friendly” commissioned report, and that wind turbines are getting bigger and more powerful all the time, we should really be looking at a minimum setback distances of 1500 metres. Remembering that it takes the government over a decade to replace guidelines, perhaps we should plan for the future (a foreign concept to the Minister, it would seem) and ask for a setback distance of 2000 metres? What must happen now is that each and every one of us to need make submissions to both Ministers, and to each of our constituency TDs and to each of our local County Councillors to let them know in no uncertain terms that we demand immediate action on bringing in proper protection against wind farms by having an effective setback distance of at least 1500 metres, preferably 2000 metres. There were 7497 submissions back in 2013 – we can do better than that now! A template letter in Word format is attached here: letter-template-wind-guidelines-2017 Please edit to taste and send to the Ministers and all your public representatives. CAWT Donegal has opened the door – let’s use the opportunity!